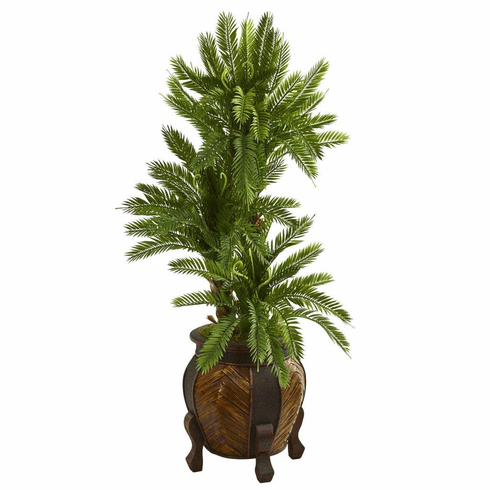 Native to the old world, the artificial triple cycas is a timeless plant that is suitable to be used in either a home or office. Settled in a decorative vase, you won’t be able to look away from the delicate, full greenery that will stand out in any room. If using it to decorate your home, then place it in your sunroom, allowing the natural light to filter through and illuminate the brilliant green foliage of this faux plant. Height: 4 Ft., Width: 23 In., Depth: 23 In., Color: , Pot Size: H: 15 In. W: 12 In. D: 12 In.